The Embassy of Trinidad & Tobago located in Washington, DC can be viewed here: [Moved to this Thread]. Other Trinidad & Tobago Missions / Embassies can also be found here. I have been getting calls for the Trinidad & Tobago Embassy in Washington, but I merely was authorized to designed the old site. I have moved the content here as an archive and for updates. Address: 1708 Massachusetts Avenue, N.W. 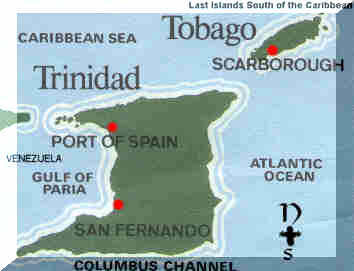 Trinidad & Tobago are the last islands South of the Caribbean. They were discovered by Columbus on his third voyage. It is a Republic and received its Independence from Great Britain on the 31st August, 1962. The population of the combined countries is approximately 1.3 million. Its main revenue is from oil and natural gas. The peoples are made up of African, East Indian, Syrian and European descent. A small population of Asians is also on the rise. Mixed races is very apparent. The official language is English (Queen's), although a local dialect is widely spoken and accepted. Other languages include: Spanish, French, Hindi (Urdu), Patwa, etc. The islands are known for steel pan, calypso, cricket (Brian Lara), cricket, fetes (Parties) and growing international business ventures (Oil / gas / exports). Recently, the "Soca Warriors", the national football team, qualified for the 2006 World Cup in Germany. Why not plan your cruise around Trinidad & Tobago. Contact your Caribbean cruise travelagent for arrangements. Basically, Trinidad & Tobago is a friendly nation seeking peace and good will with all peoples from all walks of life. The country has been able to show this within itself because of its multiracial, multiethnic, and multi-religious groups living in harmony. There are many colourful and informative leaflets, maps, and brochures available for free to those interested in learning more about Trinidad & Tobago. Feel free to contact the Embassy. When you mention the Caribbean or an island in the Caribbean to someone abroad (Especially North America or Europe) they immediately think of a Caribbean cruise, beaches, hotels and so forth. It is true that Trinidad & Tobago is a great tourist destination, but we are also the leading Caribbean producer of oil and gas which has earned us a reputation as an excellent investment site for international businesses. In the past, the Football team known as the "Soca Warriors" Played in the Germany 2006 World Cup. Together with local artistes and even dancers (Shiv Shakti) this helped to establish a fantastic image to the word. (A) Every person (Including minors) seeking admission at a port of entry into Trinidad and Tobago must be in possession of a valid travel document/ passport. (B) A person who is not a citizen or a resident of Trinidad and Tobago must be in possession of a valid return ticket to his/her homeland or country of residence or a security deposit or bond as required by the Chief Immigration Officer. Â© A person who is not a citizen or a resident of Trinidad and Tobago must be in possession of sufficient funds for his/her upkeep during his/her stay in Trinidad and Tobago. (D) A person who is neither a citizen nor a resident of Trinidad and Tobago must provide a proper local address. (E) A person who is neither a citizen nor resident of Trinidad and Tobago and who is a citizen of a country that requires a visa for entry into Trinidad and Tobago must be in possession of such. (F) Every person seeking admission to Trinidad and Tobago on arrival must complete an Immigration E/D Card (Form 1). Work Permit, Student Permit, Missionary Permit, Minister's Permit, or Certificate of Recognition of Caribbean Community Skills Qualification.